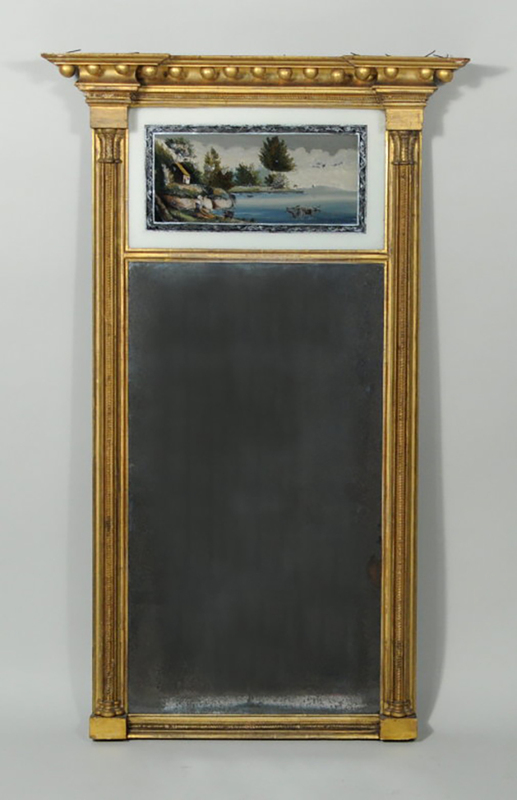 Thomas Schwenke, Inc. 50 Main St. North Woodbury, CT 06878 fedfurn@schwenke.com www.schwenke.com Sheraton Architectural Mirror Very fine sheraton carved and gilded architectural mirror, having a cove molded cornice with inset gilded spherules, above an upper eglomise panel depicting a pastoral landscape, above the original mirror plate, flanked by cove molded columns with inset twist molding. Original condition including the back board. Probably New York, circa 1810. 47" high, 28 1/2" wide.